WATT Fuel Cell Fulfills First Purchase Order for Imperium(TM) with Shipments to Erwin Hymer Group North America Inc.
WATT Fuel Cell Fulfills First Purchase Order for Imperium™ with Shipments to Erwin Hymer Group North America Inc.
MOUNT PLEASANT, Pa., Sept. 27, 2018 /PRNewswire/ -- WATT Fuel Cell Corporation ("WATT" or the "Company") has made multiple commercial shipments of its Imperium Solid Oxide Fuel Cell (SOFC) system to Erwin Hymer Group North America Inc. ("EHGNA") in Cambridge, Ontario. These shipments mark the first deliveries of WATT's Imperium Fuel Cell System for integration into a consumer product. "We are thrilled to be moving forward with the WATT Imperium system after successfully piloting it earlier this year," stated Jim Hammill, President and CEO of Erwin Hymer Group North America Inc. "We have always been on the forefront of technologies that allow our owners to boondock longer, reach farther destinations and enjoy every moment with their coach. WATT's Imperium system will allow our owners the freedom to do just that and we know it's going to be a game changer in the industry," added Hammill. In solidarity with EHGNA, WATT Fuel Cell was on-hand at the RV Suppliers & Vendors Exhibition September 24th – 27th, 2018 in Elkhart, Indiana supporting EHGNA's introduction of WATT's SOFC technology to their dealer network. "Erwin Hymer Group North America Inc is a leader in the recreational vehicle industry known for bringing innovative products and vision to the RV market," said Caine Finnerty, President and Founder of WATT Fuel Cell. "They are a natural fit as a partner for WATT. The road to commercialization is a long one, and who better to travel that road with than a company that sells thousands of premium recreational vehicles specifically designed to enhance every aspect of that travel experience." Manufactured at WATT's facility in Southwestern Pennsylvania, the Imperium is a hybrid SOFC power management system that creates small-scale power, 500W to 1.5kW, from readily available and easily accessible fuels and manages renewable energy sources. The Imperium SOFC system delivered to EHGNA will utilize the hybrid power manager to integrate the fuel cell with solar generation while optimizing on-board energy storage. It will create power efficiently and quietly from propane and solar energy with little to no engine noise or harmful exhaust. "This is the day that WATT has been diligently working towards for a long time," added Paul DeWald, Vice President of Engineering of WATT Fuel Cell. "We wouldn't have been able to achieve the milestone of delivering on our first order without the effort of our entire team, and this is just the beginning. We are looking forward to fulfilling our existing backlog of orders and advancing the adoption of our fuel cell technology within our other markets." 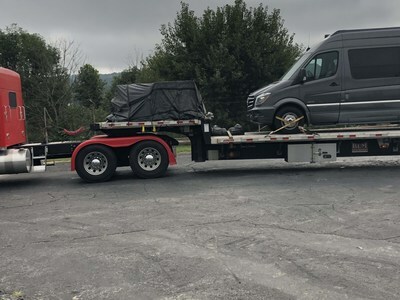 The initial shipments of the Imperium are part of a larger purchase agreement from EHGNA and signals WATT's official entrance into the RV market. Additional shipments to EHGNA, as well as the fulfillment of orders the company has received from other partners in the residential and rail markets are expected to continue throughout the remainder of 2018 and well into 2019.